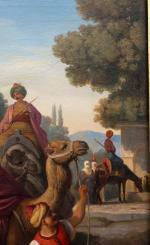 Title: From the estate of Archduke Maximillian of Austria and Emperor of Mexico: " The Bridge of Caravans at Smyrna"
This rare orientalistic painting depicts rasting Ottoman caravane by famous Bridge of Caravans at Smyrna and was executed in 1830s by renowned German historical painter Johann Michael Wittmer (1802 Murnau in Upper Bavaria - 1880 Rome). 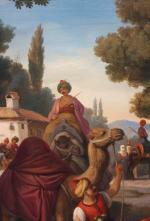 The author created this work based on his travel to Sicily, Malta, Corfu, Constantinople, Smyrna and Asia Minor, which he undertook at the invitation of the Bavarian Crown Prince, futured Maximillian II, King of Bavaria in 1833. Our painting is listed in the famous German monography by Fr. von Boetticher " Malerwerke des 19. 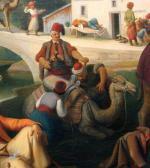 Jahrhunderts" among other works by Wittmer under number 16 with the original artist's title in Italian: "Ponte delle Caravane in Smyrna" and with the info about painting's owner (at that time ): purchased by Archduke Maximillian (Archduke Maximilan of Austria and Emperor of Mexico, the younger brother of Austrian Emperor Franz Joseph). Smyrna (now Izmir, the third largest city of Turkey), in the time was a cosmopolitan city and important trade center, where lived Turks, Greeks, Jews and Armeniers and especially where caravans came with carpets from across Asia Minor.
" 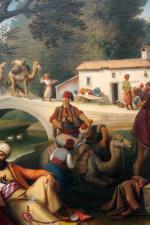 Apart from the bazaar , Caravan Bridge was a spot greatly attaractive to travellers. The name is quickly explained. The camel caravans about set off for Anatolia were assembled at this place, the equivalent of the modern bus terminal in Turkey; the bridge was a Roman , possibly Bysanthine, aqueduct. It still exists. 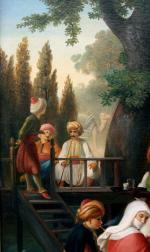 The Caravan bridge lay but a short walk north of the city; the inhabitants of Smyrna were fond of strolling there in the evening, .. the large number of persons seated on chairs and taking refreshments under the shadow of the coffee-house trees...the place of the proper observation point from which to watch tableau of Ottoman social life. The scenary of this "Smyrnean paradise" was made of a small stream , in antiquity the river Meles, coffee gardens, picnic grounds, a cemetery full of tall cypresses and an old bridge with a single arch. Partaking of coffee and tobaco was one amusement, listening to story tellers was another...."
Johann Michael Wittmer (15 October 1802, Murnau am Staffelsee - 9 May 1880, Munich) was a German painter who came from a family of painters and sculptors and was associated with the "Deutschrömer" (Germans artists and writers who lived in Rome). He is often referred to as "Johann Michael Wittmer II", to distinguish him from an earlier family member of the same name. In 1820, he used some hard-earned money to attend the Academy of Fine Arts, Munich, where he studied until 1828; first with Johann Peter von Langer, then Peter von Cornelius, who obtained work for him, assisting other artists with their commissions. These jobs enabled him to save enough money to go to Rome, although he had to walk there, by way of Venice and Florence. Once there, he joined his fellow Catholic Germans as a member of the Collegio Teutonico. Work was hard to come by, however, and his situation did not improve until 1832 when, through the mediation of Count Franz Pocci, he was introduced to Crown Prince (later King) Maximilian of Bavaria. One of his first assignments was to accompany the Prince on a trip to Naples and copy the frescoes there. 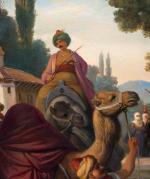 The following year, he accompanied the Prince on a grand tour of the "Orient", visiting and painting numerous historical sites throughout Greece then, following a visit with Maximilian's brother Otto, on to Constantinople (Istanbul) where the Prince's influence enabled them to see parts of the Hagia Sophia that were not open to the public. Upon their return to Italy late in 1833, Wittmer was kept busy completing various projects for the Prince and his family, including a fresco at the Prince's castle in Hohenschwangau. Tragedy struck in 1835 when most of Murnau was destroyed by a fire, leaving his family's extensive collection of paintings and drawings lying in ashes. 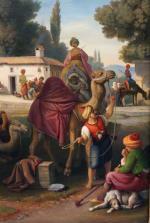 The year 1839 saw the death of his father-in-law, Joseph Anton Koch, who had been a major influence on his painting style. After that, he became more deeply involved in his work, devoting himself almost entirely to paintings with Christian motif in the style of the Nazarene movement. When Maximilian (now the King) returned to Rome, he planned to have Wittmer accompany him on another trip, but it never materialized. The King's patronage continued, however, and Wittmer made trips to Bavaria almost every year after 1857, but turned down the offer of a professorship in Munich, preferring not to make his wife and children relocate. He became ill during a trip to Munich and died peacefully there shortly after his arrival. 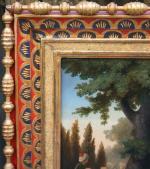 Provenance: former property: Archduke Maximillian of Austria and Emperor of Mexico, directly purchased by him from from artist; purchased by us a few years ago from a noble collection in Graz. Literature: "General Artist´s Lexicon " by Thieme/Becker; Brigitte Salmen: Johann Michael Wittmer (1802–1880). Studien zu Leben und Werk. Dissertation, Universität Passau 2007; Hyacinth Holland : Wittmer , Johann Michael . In : General German Biography ( ADB ) . Volume 43; Georg Kaspar Nagler: Wittmer, Johann Michael. In: Neues allgemeines Künstler-Lexicon. 1866; in on-line: wikipedia.org. Inscription: signed lower in the middle on the wood box: "M.Wittmer F(Fecit)", on the back of the canvas titled by the artist in Italian:" Ponte delle caravane a Smyrna. M.Wittmer"
Technique: oil on canvas. Luxuriousy original period gold-plated wood frame. Measurements: unframed w 24 1/3" x h 18 1/8" (62 x 46 cm), framed w 31 1/8" x h 24 3/4" (79 x 63 cm). Condition: in very good condition, original canvas. Under UV Light- old professionally inpaintings in unimportant areas.